On his 78th birthday, the Dalai Lama has highlighted 50 ideas that can help achieve world peace. 1) If people trust you, you have no grounds for fear, suspicion or jealousy. 2) Despite the superficial differences between us, we need to have a sense that all 7 billion human beings belong to one human family. 3) What we do need to do is to find ways to incorporate advice about warm-heartedness into our education system. 4)When we develop care and concern by thinking of others not as ‘them’ but ‘us’, there is no room for bullying, exploitation or deceit. 5) Genuine peace is based on inner peace, because you cannot build peace on the basis of anger. 6) Our real guide is our own mind, our sense of reason. We naturally have self-interest, but it should be wise rather than foolish self-interest by taking others' needs into account as well as ours. 7) I feel that each of us has the potential to make some contribution, and together, working with a clear aim, we can change our world. 8) Human happiness depends on taking others into account. 9) If we make consistent effort, based on proper education, we can change the world. 10) It is expressions of affection, rather than money and power, that attract real friends. 11) We need to strengthen such inner values as contentment, patience and tolerance, as well as compassion for others. 12) Everybody wants a happy life and a peaceful mind, but we have to produce peace of mind through our own practice. 13) Just as ripples spread out when a single pebble is dropped into water, the actions of individuals can have far-reaching effects. 14) Serving and helping others out of compassion is non-violence in action. 15) Most of our problems are related to the mind, so we have to work to reduce our destructive emotions. 16) If we can refrain from harming others in our everyday actions and words, we can start to give more serious attention to actively doing good. 17) Placing all our hope on material development is clearly mistaken; the ultimate source of happiness is within us. 18) If we can cultivate a concern for others, keeping in mind the oneness of humanity, we can build a more compassionate world. 19) It’s unrealistic to think that the future of humanity can be achieved only on the basis of prayer. What we need is to take action. 20) Concern for others’ well-being reduces fear and suspicion, prompting the openness and transparency that gives rise to trust and friendship. 21) Anger, hatred and jealousy can never solve problems. Only affection, concern and respect can do that. 22) Refraining from harm - not out of fear, but out of concern for others, their well-being and out of respect - is non-violence. 23) Whether we are happy or not depends on our attitude; compassion, for instance, leads to a calmer mind. 24)Education is the way to achieve far-reaching results; it is the proper way to promote compassion and tolerance in society. 25) Healthy, happy families and a healthy peaceful nation are dependent on warm-heartedness. 26) The challenge today is to convince people of the value of truth, honesty, compassion and a concern for others. 27) To make this a century of dialogue, we need to find ways to promote a greater awareness of the oneness of humanity. 28) It is vital that when educating our children’s brains, we do not neglect to educate their hearts by nurturing their compassionate nature. 29) If you are honest, truthful, and transparent, people trust you. 30)Just as we encourage physical hygiene to preserve our health, we also need a sense of emotional or mental hygiene too. 31)We live in a world in which we are dependent on others; we cannot expect to fulfil our goals while disregarding others’ needs. 32) We forget that despite the superficial differences between us, people are equal in their basic wish for peace and happiness. 33) People think of animals as if they were vegetables, and that is not right. We have to change the way people think about animals. I encourage the Tibetan people and all people to move toward a vegetarian diet that doesn’t cause suffering. 35) Be kind whenever possible. It is always possible. 36) Happiness is not something ready-made. It comes from your own actions. 37) Old friends pass away, new friends appear. It is just like the days. An old day passes, a new day arrives. The important thing is to make it meaningful: a meaningful friend or a meaningful day. 38) This is my simple religion. There is no need for temples; no need for complicated philosophy. Our own brain, our own heart, is our temple. The philosophy is kindness. 39) Love and compassion are necessities, not luxuries. Without them, humanity cannot survive. 40) All major religious traditions carry basically the same message - love, compassion and forgiveness. The important thing is that they should be part of our daily lives. 41) When you are discontent, you always want more, more, more. Your desire can never be satisfied. But when you practice contentment, you can say to yourself: Oh yes. I already have everything that I really need. 42) The purpose of our lives is to be happy. 43) In the practice of tolerance, one's enemy is the best teacher. 44) We can live without religion and meditation, but we cannot survive without human affection. 45) When you practice gratefulness, there is a sense of respect toward others. 46) The roots of all goodness lie in the soil of appreciation for goodness. If you want others to be happy, practice compassion. 47) If you want to be happy, practice compassion. 48) It is important to consider others at least as important as ourselves. This is the essence of spirituality. 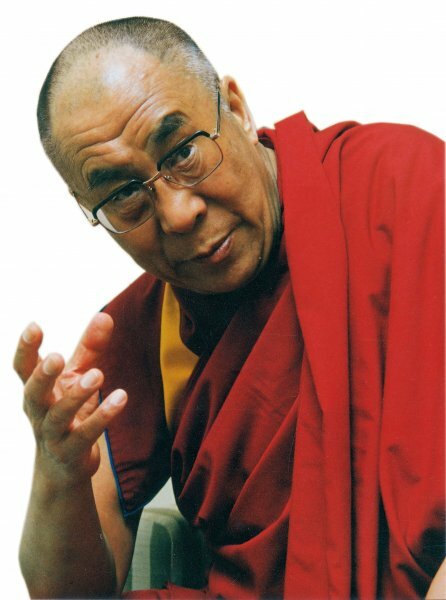 49) A number of people have said to me, after hearing my thinking, that their mind becomes much happier, concludes the Dalai Lama. I sure hope fellow seekers feel totally refreshed, like a walk in the rain, after this talk with the adorable and simple spiritual leader.